Sara Faye Golshani was born January 28th, 1983 to Parviz and Joyce Golshani. Sara learned Farsi, the native language of her father, as a child. (Golshan is the town in Iran where the family is from). Sara's parents unfortunately divorced when Sara was young. Her father remarried and they lived with him in Georgia. 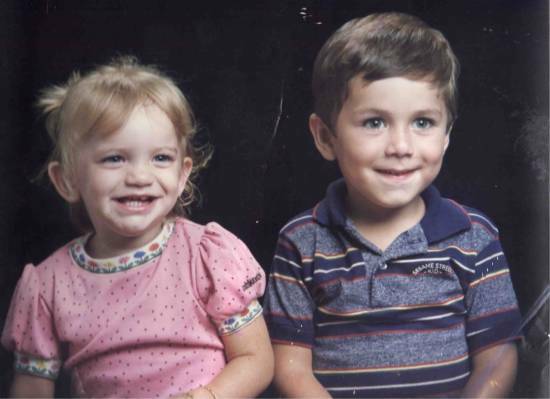 Little Sara with her brother Amir. Sara in 2005 Sara graduated Chattahoochee High School in 2002. After graduating, Sara attended Georgia State University, where Jaime Wogsland, who would eventually become her sister-in-law, was her roommate. She graduated Georgia State in 2006 with a degree in ???. Thereafter she married Bryan ???. Parviz Vossough Golshani 1948 - ? Joyce Roberta Laycak 1957 - ? Last modified on 21 December 2005 by Bradley James Wogsland.